The Clarets jumped back to second in the Championship ahead of the top-of-the table clash with Middlesbrough as they beat Birmingham City 2-1 to stretch their unbeaten run to 19 games. 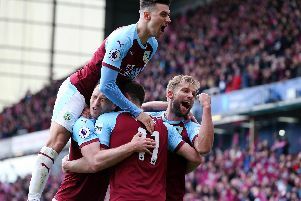 The Gods had been looking down on rivals Middlesbrough and Brighton in recent outings as the pair profited from late goals recently but the Clarets showed plenty of character to put that misfortune aside and claim another vital victory. Sky Bet Championship Player of the Year nominee Andre Gray proved the match winner ahead of tomorrow's ceremony, scoring his 24th goal of the season after Jacques Maghoma had cancelled out George Boyd's first half opener. At this stage of the season points take precedence over performances and, similarly to the victory over Leeds United, that was the case at St Andrews. With the hosts falling off the play-off pace, losing three of four games on home soil, the afternoon seemed to be more of a celebration of Villa's demise as they sat on the brink of relegation from the Premier League. And Gary Rowett's side played without the pressure that seemingly hampered the Clarets in the early stages of the fixture as things had tightened up at the top of the Championship prior to kick off. Michael Keane's reluctance to clear his lines provided the Blues with their first opening when Maghoma drew the foul, David Cotterill delivered the resulting set-piece and Ryan Shotton glanced wide. Sean Dyche's side were fortunate to see Chris Wood squander a couple of excellent openings at Turf Moor last weekend and this time it was Maghoma's failure to hit the target that let them off the hook. Jon Toral led the counter, feeding Cotterill to his right hand side, and when the cross was directed in to the box Maghoma somehow fired wide of the upright when unmarked on the penalty spot. However, after Scott Arfield's ambitious volley travelled over the crossbar, the visitors went ahead. Boyd capitalised on City's failure to clear Matt Lowton's cross and the winger tucked the ball inside the near post to give the Clarets the lead. City responded but they found goalkeeper Tom Heaton in good form as the England international gathered David Davis's header from a corner before stopping Cotterill's free kick. With just minutes of the half remaining the away side should've been awarded a spot kick but referee Mark Heywood was oblivious to the incident. Once Boyd's effort was diverted wide by the toe of City skipper Michael Morrison, Arfield's corner was cleared by the arm of Maikel Kieftenbeld. The Clarets appealed but their cries were ignored. Then, in the closing stages, Heaton did well to readjust his position to plunge low to his left and palm Cotterill's deflected drive to safety. Leading scorer Gray hadn't had much of a look in in the first period but he drew a fine save from Adam Legzdins soon after the interval. The striker used his strength to shrug off Morrison and latch on to Boyd's pass but, from an acute angle, fired at the legs of City's number one. Burnley certainly worked the ball better after the break and they went agonisingly close to extending their advantage. Arfield, Ashley Barnes and Boyd combined to work the ball to substitute David Jones, who had replaced the injured Joey Barton at the interval, but the midfielder pulled his effort just wide of the upright. Jones was involved again shortly after when lifting the ball in to Barnes inside the penalty area only for the striker - making his first start in 11 months in the same city where his injury was sustained - picked out the wrong side of the post left-footed. But the hosts hit back. John Toral wrapped his left boot around the ball from 18 yards out, Heaton beat the ball back in to the box and Maghoma was first to react to nod the ball in to the corner. The Clarets went again and went close to regaining the lead when Legzdins turned Lowton's attempt around the post after the full back moved infield to shoot from a central position. At the other end Clayton Donaldson was wasteful when given the benefit of the doubt by the linesman as he skewed wide. City went even closer moments later when Jonathan Grounds's header came back off the bar from Cotterill's corner and that ultimately proved decisive. After Dean Marney sliced wide from Lloyd Dyer's pull back, the visitors restored the lead. Barnes fired the ball in to the feet of Boyd, the winger did well to work space inside the box before clipping the ball to the far post where Gray, unmarked, guided the ball in to the roof of the net. Substitute Diego Fabbrini fizzed an effort over the bar as City looked to cause the Clarets heartache but Toral's late dismissal, courtesy of two bookable offences, diminished any hope of that.